QuickWave delivers time domain displays of the absolute value of the Poynting vector in the circuit. QW-Simulator allows dynamic monitoring of Poynting vector during time-domain simulations with any kind of excitation. For such monitoring no special arrangements are needed before launching the simulation. The user can decide at any time of the simulation: which Poynting vector components are of interest, what kind of displays he prefers and how many windows he wants to open. 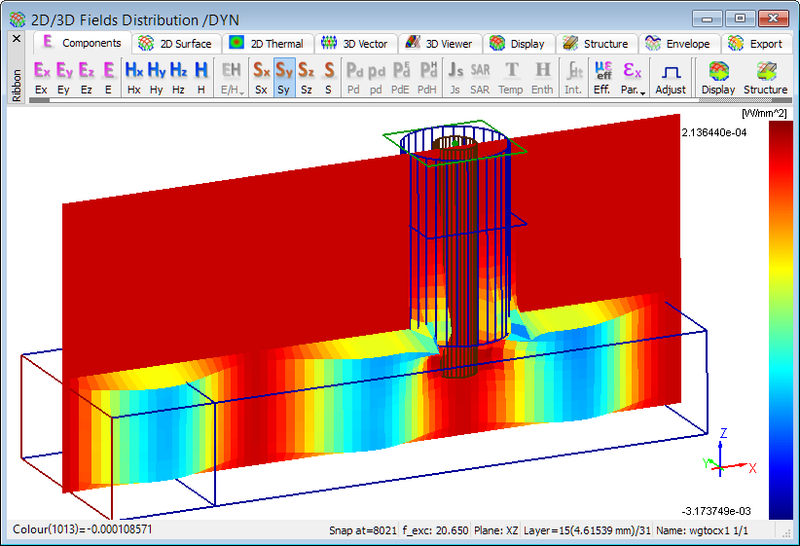 QuickWave enables monitoring directional components of Poynting vector (Sx, Sy, Sz) as well as total Poynting vector (S). QuickWave delivers the 2D distribution of the time-dependent Poynting vector, which is available for every FDTD layer along each of three axes. 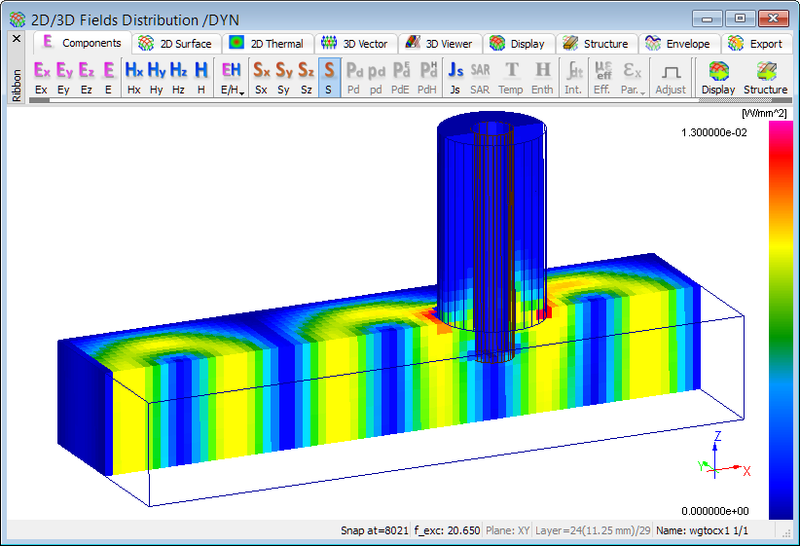 The 2D Poynting vector distribution is available in the 2D/3D Field Distribution window, which enables monitoring and displaying of the amplitude (instantaneous, time-maximum, time-average) of total Poynting vector S as well as its directional components (Sx, Sy, Sz). The unit for Poynting vector is [W/mm2]. QuickWave offers the time-dependent 3D vector display of the instantaneous values of total Poynting vector distribution. This feature is enabled in 2D/3D Field Distribution window and allows for displaying Poynting vector S in the circuit with arrows. The 3D vector display is not enabled for Poynting vector directional components Sx, Sy, and Sz. 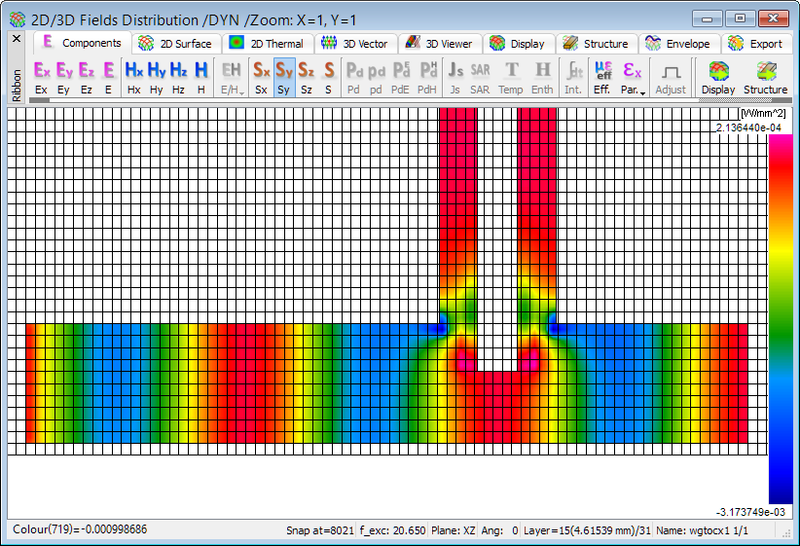 QuickWave delivers also the Viewer 3D display of the time-dependent Poynting vector (S, Sx, Sy, Sz) distribution. 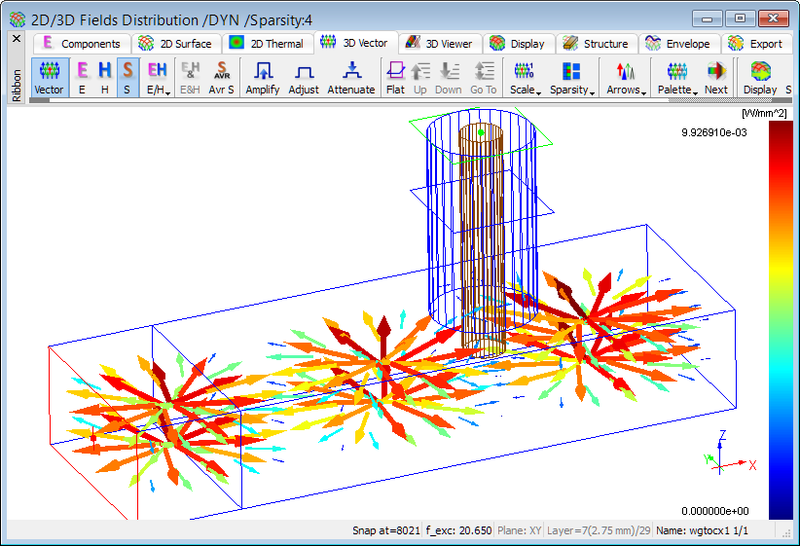 This feature is enabled in 2D/3D Field Distribution window and allows for time domain monitoring of instantaneous, time-maximum, and time-average values of the Poynting vector. See also online documentation about Poynting vector.